Ocean observation is important to understanding how our oceans are changing and predicting how our coasts and fisheries are affected by those changes. Increasing the availability and sharing of ocean data and the resulting scientific knowledge ensures Canadians can safely navigate through our coastal waters, maintain our coastal economy, and build resilient coastal infrastructure. On 7 March 2019, Fisheries and Oceans Canada announced an investment of $1.5 million per year to support the Canadian Integrated Ocean Observing System (CIOOS). An additional $2 million over four years will be provided by the Marine Environmental Observation, Prediction and Response Network (MEOPAR). Our first in a series of free technical workshops was held on 8 March 2012 at the University of British Columbia’s Department of Earth and Ocean Sciences in Vancouver. 12 attendees from UBC, Simon Fraser University and the Federal Department of Fisheries and Oceans joined Ocean Networks Canada staff members for the day-long session. In the March 29th Times Colonist article 'Dead pigs in a sea of science', Dr. Verena Tunnicliffe, Director of the VENUS Observatory, outlines a forensic research project with dead pigs, currently underway at the Central Node of the Georgia Strait. Scott McLean, Tom Dakin and Jeff Bosma manned the Ocean Networks Canada booth at Oceanology International 2012, the largest ocean technologies exhibition in the world. This 3-day event happens every 2 years in London, UK. Our booth featured Ocean Networks Canada, VENUS, NEPTUNE Canada, ONC Centre of Enterprise and Engagement & BC government displays. Traffic at the booth was heavy. There were so many discussions & meetings that ONCCEE staff were unable to sit in on any presentations or visit all the exhibitor's booths, though Scott did present a talk on behalf of NEPTUNE Canada. Citizen scientist Harold Smith has now contributed over 10,000 annotations to Ocean Networks Canada's video database using the Digital Fishers crowdsourcing tool. For more than 6 years VENUS has been deploying and operating various camera systems on its network collecting imagery from Saanich Inlet and Strait of Georgia. Growing interest from the research community that rely on visual data from the deep ocean to conduct their experiments have led VENUS to expand the selection of cameras installed on the network. As of December 2011, VENUS operates 4 cameras – two in Saanich Inlet and two in the Strait of Georgia. Verena Tunnicliffe, (former) Director of VENUS, and Tom Pedersen of the Pacific Institute for Climate Solutions, gave a public presentation called "Insulting the World's Oceans" as part of the UVic IdeaFest on 5 March 2012. Ocean Networks Canada Director, Dr. Kate Moran, introduced Ocean Networks Canada and a new way to explore beneath the ocean's surface to a TEDx audience in Vancouver last November. Fin whales are the world’s 2nd largest whale species (blue whales are the largest). These majestic creatures inhabit temperate to sub-arctic waters in both the northern and southern hemispheres. Within the Pacific Ocean basin, there are at least 3 geographically distinct populations. In the North Pacific Ocean, fin whales have been observed as far north as the Chukchi Sea during the summer months while in winter, they spend their time off the coasts of Korea and Japan in the West Pacific, and off northern Baja California in the East Pacific. The W.M. Keck Foundation has awarded $1 Million to Woods Hole Oceanographic Institution (WHOI) for a new geodesy observatory to be connected to Ocean Networks Canada and the Ocean Observatories Initiative Regional Scale Nodes (OOI RSN). This interdisciplinary project, led by Dr.Jeff McGuire and John Collins of WHOI, will allow scientists to monitor three Cascadia subduction zone segments off the coasts of Vancouver Island, Washington and Oregon. One and half years in the making, Ocean Networks Canada's first community observatory went live in late December, with handover to the school providing the opportunity to test and develop the system with Brentwood College students and teachers. Six years ago at 4:45 AM, 8 Feb 2006, the first VENUS instrument platform was plugged into the central node and brought online. Congratulations to VENUS on another year of groundbreaking science! This past year, Ocean Networks Canada has bolstered its international strength and linkages by appointing an eleven-member International Science Advisory Board made up of highly respected senior ocean scientists drawn from the United States, the UK, Japan, Australia and Canada. Ground has been broken and construction is now underway on a new test tank and storage facility at our Marine Technology Centre (MTC). The first vessel selected to host a SeaKeeper 1000 instrument system for Ocean Networks Canada data collection is BC Ferries’ Queen of Alberni. The system will support the following seawater sensors: temperature, conductivity (salinity), oxygen, chlorophyll and turbidity, and in addition it will be integrated with a comprehensive meteorological sensor suite located on the upper decks of the ferry. The Alliance for Coastal Technologies (ACT) is currently accepting preliminary applications from developers, manufacturers, and distributors of commercially available, in situ pH sensors interested in participating in independent performance testing. ACT will review responses from interested parties and invite those with technologies that meet established criteria to submit a full proposal package. During the last few years, engineering and science teams at Ifremer, France's national public institute for marine research have developedTempo-Mini: a custom-designed instrument package for real-time monitoring of hydrothermal vent communities and their environment. Monitoring surface currents in real-time using this technology will bring multiple benefits to a number of organizations, helping them to make important operational decisions. The second station will be installed 20 km to the north in early 2012. Once operational, the radial data from both sites will be combined to generate vector maps of surface currents in a 20 km X 20 km grid between the stations. This image is the final design concept drawing of the buoy profiler system prepared by Chris Sundstrom of the Ocean Networks Canada engineering team. This system is part of the VENUS Phase II – Geospatial Expansion development. The surface system will support a water column profiling package and will be moored in a central Saanich Inlet location. Kate Moran, the new Director of NEPTUNE Canada, has been invited to speak at the upcoming TEDx conference in Vancouver on November 12, 2010. For the past four years, the Paleoenvironmental Laboratory of Dr. Vera Pospelova (University of Victoria, SEOS) has been involved in continuous monitoring program of fossilizable phytoplankton in Saanich Inlet, British Columbia. Scientists from Canada and France began deploying a cabled piezometer at 9:45 am (PDT) on Wednesday, July 6, 2011 at the Cascadia Basin site. This is the first operation of the NEPTUNE Canada July 2011 installation and maintenance cruise on the R/V Thompson. In visible company was the R/V Atlantis, the sister ship of the R/V Thompson, with a crew of researchers working on nearby Ocean Drilling Program (ODP) boreholes, an illustration of the high interest in the thin oceanic crust of the Juan de Fuca tectonic plate . Our fall 2011 installation and maintenance expedition sailed September 10 – 30 aboard the R/V Thompson. It was a very active time for 7 Ocean Networks Canada staffers, 4 contractors, 1 Pacific Geosciences Centre technician, 1 volunteer, an 8-man ROPOS crew, 2 marine techs and the 21 crew members of the R/V Thompson. During our 20 days at sea, we completed 13 ROPOS dives at three locations, including a trip into Bamfield for parts. The Folger Pinnacle instrument platform was installed on August 23, 2010 (watch the installation cruise highlights) and connected on February 2, 2011 by a combined team of Pelagic Technologies divers, the Bamfield Marine Sciences Centre (BMSC), and Ocean Networks Canada. Since then, a wealth of data has been gathered by instruments affixed to this 23m deep platform. However, in recent months, Dilumie Abeysirigunawardena, one of our data specialists, noticed a drop in the instruments’ data quality and sensitivity. July 2011 Expedition Comes to an End! From July 4 - 25, 2011, Ocean Networks Canada navigated an impressive installation and maintenance expedition in the northeast Pacific Ocean. Diving down to the seafloor to investigate our 800-km cabled network observatory along the northern Juan de Fuca plate, we tended to our technically-advanced instruments and witnessed some of the amazing marine life dwelling off the coast of Vancouver Island, British Columbia. This technology can increase classification rates by providing a continuous stream of objects-of-interest. The IBM InfoSphere Streams system along with new image processing software will be used to automatically flag specific times in the underwater video archives. The processed video will be tagged with the appropriate metadata (e.g. object type, object size, movement, time). The result will be the ability to skip ahead to the next remarkable observation caught on camera without wading through numerous hours of insignificant video. Observation times will be reduced, allowing scientists to reach their conclusions quicker. There’s an Octopus in Our Mooring! 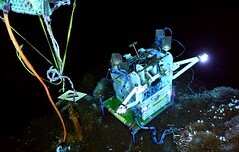 Aboard the Tully in May 2011, the VENUS team recovered an autonomous mooring deployed at the Central Strait of Georgia site in April 2010. During recovery, the team discovered that a giant pacific octopus had taken up residence in the mooring and, along with ROPOS and the mooring, made the trip to the surface. Nobody ever promised this would be easy, especially when it came to installing POGO, our one-of-a-kind vertical profiler system (VPS). Researchers at the University of Victoria wondered if crowd sourcing might be harnessed to identify and classify fish swimming through Ocean Networks Canada’s many hundreds of hours of underwater video archives. Two biology instructors, Thomas Reimchen and Roswitha Marx along with graduate assistant Steve Leaver conducted a unique experiment this spring, engaging an ichthyology (fish zoology) class in fish identification exercises via SeaTube, our underwater video viewer. Our Folger Pinnacle instrument platform is now up and running after a team of divers plugged in the extension cable connecting it to Folger Passage node and the rest of the NEPTUNE Observatory last week. Glenn Hafey of Pelagic Technologies made the actual connection after he and his 4-man team dove 23m to the platform from the Bamfield Marine Science Centre’s 9.8m aluminum dive support boat, the Barkley Star. Although underwater sound pollution is suspected to have many negative impacts on marine life, pinning them down is not so easy. To do so, we need to better understand when and why marine animals use different types of vocalizations and how they mentally process the sounds they hear. Celebrate World Oceans Day With Us! Meet the new science Theme Leaders! Introducing Campbell River's new observatory! Ocean Networks Canada to coordinate earthquake early warning system for B.C. The Northeast Pacific Blob: fading or not? South coast communities feel the shake! Explore the ocean depths—live—while ONC wires the abyss! A sea of crabs captured on camera! Come celebrate World Oceans Day 2015 with us! Launching a Live Data Stream with Van Aqua and OceanWorks! Crabs everywhere! A mystery caught on camera! Drop, Cover and Hold On! What's the Deal with Flatfish? Follow the VISIONS '14 expedition! Cambridge Bay, a Year of Data!